The station as seen from San Onofre State Beach to the north. The San Onofre Nuclear Generating Station (SONGS) is a closed nuclear power plant located south of San Clemente, California, on the Pacific coast, in Nuclear Regulatory Commission Region IV. The plant was shut down in 2013 after replacement steam generators failed; it is currently in preparation to be decommissioned. The plant is owned by Southern California Edison. Edison International, parent of SCE, holds 78.2% ownership in the plant; San Diego Gas & Electric Company, 20%; and the City of Riverside Utilities Department, 1.8%. When fully functional, it employed over 2,200 people. Located between the ocean and Interstate 5, the station is a prominent landmark because of its twin hemispherical containment buildings, which were designed to contain any unexpected releases of radioactive material from the power generators. The plant's first unit, Unit 1, operated from 1968 to 1992. Unit 2 was started in 1983 and Unit 3 started in 1984. Upgrades designed to last 20 years were made to the reactor units in 2009 and 2010; however, both reactors were shut down in January 2012 after premature wear was found on more than 3,000 tubes in replacement steam generators that had been installed in 2010 and 2011. The Nuclear Regulatory Commission is currently investigating the events that led to the closure. In May 2013, Senator Barbara Boxer, chairman of the Senate Environment and Public Works Committee, said the modifications had proved to be "unsafe and posed a danger to the eight million people living within 50 miles of the plant," and she called for a criminal investigation. In June 2013, Southern California Edison announced the permanent retirement of Unit 2 and Unit 3, citing "continuing uncertainty about when or if SONGS might return to service" and noting that ongoing regulatory and "administrative processes and appeals" would likely cause any tentative restart plans to be delayed for "more than a year". The company stated that "Full retirement of the units prior to decommissioning will take some years in accordance with customary practices. Actual decommissioning will take many years until completion." Controversy continues over Edison’s plans for on-site dry cask storage of the considerable amount of nuclear waste created during the facilities decades of operation. Unit 1, a first-generation Westinghouse pressurized water reactor that operated for 25 years, closed permanently in 1992, and has been dismantled and is used as a storage site for spent fuel. It had a spherical containment of concrete and steel; the smallest wall was 6 feet (1.8 m) thick. It generated 456 MWe gross, and 436 MWe net, when operating at 100% capacity. Units 2 and 3, Combustion Engineering two-loop pressurized water reactors, generated 1,127 MWe gross, and 1,070 MWe and 1,080 MWe net respectively, when operating at 100% capacity. In a ten-year project completed in 2011 and costing $671 million, Edison replaced the steam generators in both reactors with Mitsubishi steam generators of modified design. Because of the reactors' two-loop design, uncommon for such large reactors of that era, the steam generators were among the largest in the industry. A common shortcoming of these large steam generators was tube wear, requiring replacement earlier than their 40-year design life. The steam generators being the largest components in the reactor required a temporary hole through the concrete containment shell. The Unit 2 replacement was completed in 2009 and Unit 3 in 2011. Edison estimated that the modernization would save customers $1 billion during the plant's license period, which at the time ran until 2022. During its operation until 2012, SONGS provided about 20% of the power to large portions of Southern California. The San Onofre station had technical problems over the years. In July 1982, Time wrote, "The firm Bechtel was ... embarrassed in 1977, when it installed a 420-ton nuclear-reactor vessel backwards" at San Onofre. In 2008, the San Onofre plant received multiple citations over issues such as failed emergency generators, improperly wired batteries and falsified fire safety data. In its annual review of 2011, the Nuclear Regulatory Commission (NRC) identified improvements but noted that in the area of human performance, "corrective actions to date have not resulted in sustained and measurable improvement". According to the NRC, workers at San Onofre were "afraid they will be retaliated against if they bring up safety problems, something that's against the rules". As of 2011, according to the NRC, there had been progress on the issue and the problems were not considered a threat to the safety of plant workers or the public. In November 2011, there was an ammonia leak, and as a precaution company employees were evacuated from the leak area, while the units continued normal operation. A mid-cycle inspection report spanning July 2011 to June 2012 revealed three incidents relating to human performance. An additional issue concerned a failure to develop procedures for a "cyber security analysis of electronic devices" that was later corrected. In 2012, coolant fluid was found in the oil system of a backup diesel generator, which would have caused the generator to fail if needed. An internal investigation found "evidence of potential tampering", making sabotage by staff a possible cause. Southern California Edison stated after the Fukushima disaster in 2011 that the station was "built to withstand a 7.0 magnitude earthquake directly under the plant". Additionally, there was a 25-foot wall to protect the plant from a tsunami which could be potentially generated by the active fault 5 miles offshore. The closest tectonic fault line is the Christianitos fault, less than a mile away, which is considered inactive or "dead", but other active faults in the vicinity might pose some threat. The NRC's estimate of the yearly risk of an earthquake intense enough to cause core damage to the reactor at San Onofre was 1 in 58,824, according to a study it had published in August 2010. In June 2012 S. David Freeman, the former head of the Southern California Public Power Authority and "a longtime anti-nuclear voice", described San Onofre and Diablo Canyon as "disasters waiting to happen: aging, unreliable reactors sitting near earthquake fault zones on the fragile Pacific Coast, with millions of Californians living nearby". The San Onofre plant used seawater for cooling, like some other seaside facilities in Southern California, lacking the large cooling towers typically associated with nuclear generating stations. Limited available land next to SONGS would likely have required towers to be built on the opposite side of Interstate 5. More than 4,000 tons of radioactive waste are stored at San Onofre. The NRC defines two emergency planning zones around nuclear power plants: 1) a plume exposure pathway zone with a radius of 10 miles (16 km), concerned primarily with exposure to, and inhalation of, airborne radioactive contamination, and 2) an ingestion pathway zone of about 50 miles (80 km), concerned primarily with ingestion of food and liquid contaminated by radioactivity. The average prevailing westerly wind direction at San Onofre blows inland 9 months of the year. The 2010 U.S. population within 10 miles (16 km) of San Onofre was 92,687, an increase of 50.0 percent in a decade, according to an analysis of U.S. Census data for msnbc.com. The 2010 U.S. population within 50 miles (80 km) was 8,460,508, an increase of 14.9 percent since 2000. Three of the cities within 20 miles of the facility are San Clemente and Laguna Beach in Orange County and Oceanside in San Diego County. San Diego is 45 miles south of the facility, and Los Angeles is 60 miles north of the facility. On August 6, 1977, about a thousand anti-nuclear protesters marched outside the nuclear generation station, while units 2 & 3 were under construction. On June 22, 1980, in the wake of the Three Mile Island accident, about 15,000 people attended a protest rally against the San Onofre nuclear plant that was organized by the Southern California Alliance For Survival. Among the speakers was physicist Michio Kaku, who noted that one of the reactor pressure vessels had been installed backwards and called on California governor Jerry Brown (then considered an environmentalist) to shut them down. On March 11, 2012, more than 200 activists protested at the San Onofre Nuclear Generating Station to mark the one-year anniversary of the Fukushima Daiichi nuclear disaster. Two Japanese residents who lived through the Fukushima meltdowns, and Raymond Lutz spoke. They said the generators which had been offline since January 2012, should remain off. In May 2012, environmental and anti-nuclear activists gathered at Southern California Edison's Irvine headquarters calling for the San Onofre plant to be decommissioned. Units 2 and 3 after shutdown. Some joked that the facility resembled a monument to Dolly Parton. Unit 2 was shut down in early January 2012 for routine refueling and replacement of the reactor vessel head. On January 31, 2012, Unit 3 suffered a radioactive leak largely inside the containment shell, with a release to the environment below allowable limits, and the reactor was shut down per standard procedure. On investigation, the replacement steam generators from 2011 in both units were found to show premature wear on over 3,000 tubes, in 15,000 places. Plant officials pledged not to restart until the causes of the tube leak and tube degradation were understood. Neither unit was ever restarted. There were no blackouts due to the lack of SONGS electricity; more pollution was caused by the use of natural gas plants to make up for the lost power generation, and additional cost led to higher utility bills. In March 2012, the NRC forbade the plant to be reopened until the causes of its equipment problems were thoroughly understood and fixed. At the same time, Irvine Councilman Larry Agran called for the plant to be decommissioned safely and as soon as possible. Concerns included "nuclear waste stored at the plant, health hazards from radioactive material, and inadequate evacuation plans". Resolutions passed in neighboring cities Laguna Beach and San Clemente called for safer and more secure nuclear waste storage. San Clemente voted to request public information about radiation levels near the plant. The spokesman for Edison International said "the company will work to prepare detailed responses to council and community member questions and concerns". In June 2012 the environmental group Friends of the Earth filed a legal petition with the NRC, asking that any decision to restart SONGS be considered a de facto NRC license amendment which required a public hearing, rather than a decision by the NRC commissioners. Friends of the Earth submitted evidence and sworn statements of John Large of the London-based nuclear consulting engineers Large & Associates, demonstrating that the steam generating tube degradation was a generic fault of the Mitsubishi design and that Edison's power derating of the two nuclear units would not lower the rate of wear or the risk of catastrophic tube failure. SCE and NRC staff filed statements opposing the petition. In July 2012, the NRC's final report identified ten issues that needed followup and stated "the plant will not be permitted to restart until the licensee has developed a plan to prevent further steam generator tube degradation and the NRC independently verifies that it can be operated safely." As of July 2012[update], the cost related to the shutdown had reached $165 million, with $117 million of that being the purchasing of power from other sources to replace the output of the plant. The Chairman of Edison International Ted Craver stated the possibility that reactor 3 might be scrapped as "It is not clear at this time whether Unit 3 will be able to restart without extensive additional repairs". In August 2012, Southern California Edison announced plans to lay off one-third, or 730, of the plants employees; the company said that the downsizing had been planned more than two years before. Rochelle Becker of the Alliance for Nuclear Responsibility said the layoffs showed that the company was not honest about their plans for the power plant. In September 2012, Allison Macfarlane, the NRC Chairwoman, said that the plant would be down for a prolonged period, and that Unit 3 would be defueled in September 2012 because the unit had been significantly damaged. Due to the shutdown, the NRC ended requirements to monitor non-operating systems. In October 2012, SCE submitted a "Unit 2 Return to Service Report" about corrective actions, such as plugging worn tubes and preventively plugged additional tubes. It proposed a restart limiting Unit 2 to 70% power, to prevent excessive tube vibration, until an inspection within 150 days of operation. SCE reported that most of the excessive wear had been in limited areas, due to higher speed and drier steam than computer modeling had predicted, and inadequate tube support at the U-bend. Analysis had concluded operating at 70% power would eliminate the conditions that caused excessive wear. In November 2012, the NRC decided to refer the Friends of the Earth hearing request to the Atomic Safety and Licensing Board. By November 2012, the cost of the outage was over $300 million, and discussion of restarting Unit 2 had been postponed. In December 2012, the last of the four old steam generators was transported to Clive, Utah for disposal. In February 2013, the NRC asked the steam generator manufacturer Mitsubishi Heavy Industries to provide a redacted version of a report on the plant's steam generators for publication. The report described the changes made in the replacement steam generator including the removal of a support cylinder, changes to the tube support plates and anti-vibration bars, and addition of about 400 tubes. In December 2013, the NRC cited SONGS for failing to properly check the steam generator design, which had caused the plant shutdown. The finding did not carry any fine or penalty but complicated SCE's legal position that they did nothing wrong. The California Public Utilities Commission was considering whether to order a multimillion-dollar refund to SCE customers. restarting the plant with the steam generator tubes in the current degraded state is outside historical experience, and the proposal to operate them at 70% power for a limited duration before reinspection constituted the regulatory definition of "tests or experiments", requiring a license amendment. In May 2013, Senator Barbara Boxer asked that the United States Justice Department investigate possible malfeasance by Edison officials, and released a 2004 letter by an Edison executive that expressed worries that the new steam generators, though similar, would not be "like for like" replacements and could lead to the same kind of potential "disastrous" issues that in fact led to the plant's shutdown in 2012. In making the request for a possible criminal investigation, Boxer stated "This correspondence leads me to believe that Edison intentionally misled the public and regulators in order to avoid a full safety review and public hearing in connection with its redesign of the plant." Edison denied any wrongdoing. but reportedly signaled it may shut the plant down for good should the company not be allowed to restart one of the reactors at 70% of capacity. On June 7, 2013, Southern California Edison announced it would "permanently retire" Unit 2 and Unit 3, ending their attempt to restart the plant at a reduced capacity. The utility said it would cut the SONGS workforce from about 1,500 to some 400 employees, with most reductions "expected to occur in 2013". The company also said it would "pursue recovery of damages from Mitsubishi Heavy Industries, the supplier of the replacement steam generators", although the contract limited liability to $138 million and excluded consequential damages. The chief executive of Edison International explained that the current licenses expire in 2022, and with post-Fukushima requirements, which include re-evaluating earthquake vulnerability, it was uncertain renewal would be economic, so it made little sense making costly and politically difficult repairs now that would not make a return on investment before 2022. California Senator Dianne Feinstein signaled approval of the decision to permanently close the plant, stating "I firmly believe this is the right thing to do for the more than 7 million Californians who live within 50 miles of San Onofre." However, Representative Darrell Issa, whose voting district includes the nuclear station, was more downbeat, saying "our communities now face the loss of employment for more than a thousand highly skilled workers and an essential local source of low-cost, clean energy." Issa also pledged to work to improve the prospects for nuclear power nationwide. In contrast, Sierra Club Director Kathryn Phillips applauded the move, saying in a statement that "We hope, especially, that the utilities will take this opportunity to help get more locally generated renewable energy, such as rooftop solar, into their portfolios." In 2015, State Attorney General Kamala Harris opened an investigation of the Office of Ratepayer Advocates, San Diego Gas and Electric, and Southern California Edison. California state investigators searched the home of California utility regulator Michael Peevey and found hand written notes, which showed that Peevey had met with an Edison executive in Poland, where the two had negotiated the terms of the San Onofre settlement leaving San Diego taxpayers with a $3.3 billion bill to pay for the closure of the plant. The investigation was closed amidst Harris' 2016 run for the US Senate position, which opened when Barbara Boxer retired. Total greenhouse gas emissions from power plants in California increased by 35% from 2011 to 2012, according to figures from the California Air Resources Board, which per the World Nuclear News is partly due to the early closure of San Onofre. Decommissioning San Onofre will take numerous years until the process is complete. In February 2014 SCE announced that it would be auctioning off non-radioactive equipment from the former nuclear plant March 2015. In August 2014, SCE announced decommissioning would take 20 years, cost $4.4 billion and spent fuel would be held on-site in dry casks indefinitely, while Low Level Radioactive Waste would be disposed in Texas and Utah. On December 20, 2016, SCE announced it had selected a joint venture of AECOM and EnergySolutions as decommissioning general contractor for SONG. Since the Yucca Mountain nuclear waste repository plan was terminated in 2008, nuclear waste will have to be stored on site in San Onofre until Congress finds another location for a nuclear waste repository. SONG's nuclear waste is in steel-lined concrete pools known as wet storage. According to the NRC, nuclear waste must sit in these pools for about 5 years in order to cool. It then must be transferred into a more permanent, dry storage, consisting of 80 underground steel lined concrete monoliths. SCE decided on Holtec International to design the dry storage canisters. The canisters will be five-eighths of an inch thick compared to most canisters in the U.S. being half of an inch thick. These steel-lined concrete monoliths right next to the Pacific Ocean exceed California's earthquake requirements and Edison says they are designed to withstand fire and tsunamis. The canisters are prone to cracking mainly because of chloride-induced, stress-corrosion from being close to the ocean. The canisters cannot be inspected for cracks. Kris Singh, president and CEO of Holtec, says that they are working on developing inspection methods, but that even if cracks could be detected, there is no way to repair them. As an added safety measure, Holtec is providing an extra canister on site. The Electric Power Research Institute (EPRI) will be using new technologies in order to detect and protect these canisters from cracking. EPRI believes the best method for chloride-induced, stress-corrosion cracking is to apply proactive practices, which include using standard methods to classify the corrosivity of the site environment, monitoring the site specific absolute humidity, and planning for visual inspection of the canister surface in a timeframe based on the results". In April 2017 Southern California Edison agreed to move spent nuclear fuel off the site, following legal action by San Diego environmental group Citizens Oversight. In July 2013 SCE started a 90-day dispute resolution process with Mitsubishi. The dispute resolution was unsuccessful, so a binding arbitration process run by the International Chamber of Commerce commenced in October 2013. SCE claimed $7.57 billion (930 billion yen), but MHI argues that compensation is limited to $137 million by their contract. In October 2015 the owners reached a $400 million settlement with their insurers for outages caused by the failure. SCE received $312.8 million, SDG&E $80 million, and the city of Riverside $7.16 million. The arbitration claim against Mitsubishi continued to be pursued through the International Chamber of Commerce. In March 2017 the International Chamber of Commerce ordered MHI to pay $125 million compensation, capped per the contracted limit of liability. The San Onofre Nuclear Generating Station is shown in the 1987 film Made in U.S.A. directed by Ken Friedman and starring Adrian Pasdar, Chris Penn and Lori Singer. SONGS was also featured in Godfrey Reggio's 1982 experimental film Koyaanisqatsi, where sunbathers are shown on San Onofre State Beach in front of the station. Passing reference is made to the design of the containment shields (which resemble breasts) in cult comedy The Naked Gun (1987). The nuclear generating station was also used as a backdrop for the non-descript Californian nuclear reactor in the film Cloud Atlas (2012). ^ a b Tarryn Mento; Alison St John. "San Onofre To Be Permanently Closed". KPBS (TV). Retrieved 7 June 2013. ^ "Construction of San Onofre Nuclear Generating Station". Los Angeles Times. 16 June 2012. Retrieved 7 August 2012. ^ "EIA - State Nuclear Profiles". www.eia.gov. Archived from the original on 2017-05-19. Retrieved 3 October 2017. ^ a b c Abby Sewell (21 August 2012). "San Onofre layoffs raise questions about nuclear plant's future". Los Angeles Times. Retrieved 27 August 2012. ^ Mufson, Steven (June 7, 2013). "San Onofre nuclear power plant to shut down". The Washington Post. Retrieved 8 June 2013. ^ "Barbara Boxer wants U.S. probe on San Onofre". Associated Press. Politico. 28 March 2012. Retrieved 28 May 2013. ^ a b c Southern California Edison(SCE) (June 7, 2013). "Southern California Edison Announces Plans to Retire San Onofre Nuclear Generating Station". SCE corporate press release. Archived from the original on June 12, 2013. ^ Jim Shephard (29 March 2012). "San Onofre – Unit 1". United States Nuclear Regulatory Commission. Retrieved 4 September 2012. ^ a b "United States of America". Power Reactor Information System (PRIS). International Atomic Energy Agency (IAEA). Retrieved 9 June 2013. ^ a b Boguslaw Olech, Tomoyuki Inoue (14 February 2012). "Improving like-for-like RSGs". Nuclear Engineering International. Retrieved 15 June 2013. ^ "New steam generators for SONGS 3". World Nuclear News. October 4, 2010. Retrieved 14 June 2013. ^ "New steam generators in place at SONGS". World Nuclear News. February 22, 2011. Retrieved 14 June 2013. ^ Abby Sewell (22 August 2012). "If San Onofre nuclear plant is restarted, who pays?". Los Angeles Times. Retrieved 4 September 2012. ^ "The Master Builders from Bechtel". Time. July 12, 1982. ^ a b Esmeralda Bermudez (February 5, 2012). "San Onofre nuclear power plant incidents draw attention". Los Angeles Times. ^ Bernie Woodall (14 January 2008). "So. Calif. nuclear lannt worker faked fire checks". Los Angeles. Reuters. Retrieved 19 January 2013. ^ a b Onell R. Soto (April 28, 2011). "Anti-nuclear protest planned at NRC meeting". SignOnSanDiego. ^ "San Onofre Power Plant Emergency: Level 3 Alert". Huffington Post. 2 November 2011. Retrieved 19 January 2013. ^ a b Pat Brennan (7 September 2012). "Nuclear regulatory panel releases San Onofre inspection review". OC Register. Retrieved 16 September 2012. ^ Zeller, Tom, Jr. (November 29, 2012). "San Onofre Nuclear Plant Investigating Possible Sabotage Of Safety System". Huffington Post. Retrieved 26 April 2014. ^ Catherine Saillant (14 March 2011). "San Onofre nuclear plant can withstand up to 7.0 quake, is protected by a 25-foot tsunami wall, Edison says". Los Angeles Times. Retrieved 11 August 2012. ^ Christopher Helman (14 March 2012). "Could San Diego's Oceanside Nuke Plant Survive A Tsunami?". Forbes. Retrieved 11 August 2012. ^ Sharp, Robert Phillip; Glazner, Allen F. (1993). Geology Underfoot in Southern California. Yes, Geology Underfoot Series. Mountain Press Publishing Company. p. 17. ISBN 9780878422890. Retrieved 2 September 2012. So, you need not worry that an earthquake originating on the Cistianitos fault will damage the San Onofre nuclear generating plant. That fault has not moved for at least 125,000 years, perhaps not since long before then. It is dead. ^ Bill Dedman, "What are the odds? US nuke plants ranked by quake risk," msnbc.com, March 17, 2011 http://www.msnbc.msn.com/id/42103936/ Accessed April 19, 2011. ^ Richard Fausset (7 April 2010). "Anti-nuclear in the age of Obama". Los Angeles Times. Retrieved 3 September 2012. ^ S. David Freeman (Jun 2, 2012). "Viewpoints: Time has come for California to embrace a nuclear-free future". Sacramento Bee. Archived from the original on 2012-06-15. ^ "State to power plants: stop sucking in seawater". The Orange County Register. ^ a b c "Irvine leaders recommend shutting down San Onofre power plant". Orange County Register. March 27, 2012. ^ Bill Dedman, Nuclear neighbors: Population rises near US reactors, msnbc.com, April 14, 2011 http://www.msnbc.msn.com/id/42555888/ns/us_news-life/ Accessed May 1, 2011. ^ Rick Rojas (30 March 2012). "Fear grows in O.C. cities near San Onofre nuclear plant". Los Angeles Times. Retrieved 11 August 2012. Officials in nearby San Clemente and Laguna Beach — both within 20 miles of the San Onofre facility — have registered their fears after significant wear was found on hundreds of tubes carrying radioactive water inside the plant's generators. ^ Jamie Reno (29 May 2012). "With Summer Approaching, the Heat Is On to Re-open the San Onofre Nuclear Plant". The Daily Beast. Retrieved 11 August 2012. Karen Garland, a married mother of two who lives in Oceanside, 17 miles south of the plant, recalls the blackout that affected San Diego and Orange Counties last September. ^ Gerhardt, Tina (23 July 2012). "San Onofre's Nuclear Power Station's Steam Generators Worst Nation-Wide". Washington Monthly. The San Onofre Nuclear Power Plant rests on the Pacific Coast 60 miles south of Los Angeles and 45 miles north of San Diego, the second and eighth largest cities in the U.S. respectively. The nuclear power plant is within 50 miles of 8.5 million people. ^ Jameson Steed (March 12, 2012). "Anti nuclear groups protest San Onofre". Daily Titan. ^ "Protesters ask Edison to decommission San Onofre nuclear plant". LA Times. May 23, 2012. ^ a b Eileen O'Grady (March 21, 2012). "Grid looking at extended San Onofre nuclear outage". Reuters. ^ Townsend, Adam (February 1, 2012). "Update: San Onofre Nuclear Reactor Shut Down After Leak". San Clemente Patch. Retrieved 9 June 2013. ^ Gregory B. Jaczko (5 July 2012). "Letter to The Honorable Dianne Feinstein" (PDF). NRC. Retrieved 15 June 2013. ^ Abby Sewell; Ken Bensinger (July 13, 2013). "How San Onofre's new steam generators sealed nuclear plant's fate: San Onofre's replacement generators were supposed to extend the nuclear plant's life and save money. The opposite ensued". Los Angeles Times. Retrieved July 14, 2013. ^ a b Associated Press (May 28, 2013). "AP Exclusive: Calif. Sen. Boxer wants Justice Dept probe on troubled San Onofre nuclear plant". Washington Post. ^ Morgan Lee (26 January 2013). "A year off the grid: San Onofre nuclear plant's outage has caused barely a ripple in power supply; opinions differ on what future holds". San Diego Union Tribune. Retrieved 29 January 2013. ^ "Feds: San Onofre nuclear plant can't reopen until problems fixed". Los Angeles Times. March 27, 2012. Retrieved 3 September 2012. ^ a b c d e "Memorandum and Order (Resolving Issues Referred by the Commission in CLI-12-20)" (PDF). Atomic Safety and Licensing Board. NRC. 13 May 2013. pp. 6–8, 24–25, 29–37. ASLBP 13-924-01-CAL-BD01, Docket 50-361-CAL, 50-362-CAL. Retrieved 8 June 2013. ^ John H Large (22 January 2013). "1st Affidavit of John H Large in the Matter of Southern California Edison, San Onofre Nuclear Generating Station, Atomic Safety Licensing Board" (PDF). Retrieved 9 June 2013. ^ David A. Repka (8 November 2012). "NRC refers request for hearing on San Onofre steam generator replacement to atomic safety and licensing board". Lexology. Globe Business Publishing. Retrieved 9 June 2013. ^ Gerhardt, Tina (23 July 2012). "San Onofre's Nuclear Power Station's Steam Generators Worst Nation-Wide". Washington Monthly. ^ a b Associated Press (31 August 2012). "Bill for damaged San Onofre nuclear power plant in California hits $165 million, and counting". Washington Post. ^ Morgan Lee (21 August 2012). "Layoffs highlight troubles at San Onofre plant". San Diego Union Tribune. Retrieved 27 August 2012. ^ Pat Brennan (14 September 2012). "NRC: San Onofre staying offline for 'months'". OC Register. Retrieved 17 September 2012. ^ "SCE reveals San Onofre restart plan". Nuclear Engineering International. 8 October 2012. Retrieved 15 June 2013. ^ a b "Dark days for San Onofre". Nuclear Engineering International. 23 January 2013. Retrieved 15 June 2013. ^ Abby Sewell (2 November 2012). "San Onofre nuclear plant outage costs top $300 million". Los Angeles Times. Retrieved 3 December 2012. ^ Morgan Lee (12 November 2012). "NRC postpones public discussion of San Onofre reactor restart". San Diego Union Tribune. Retrieved 4 December 2012. ^ Abby Sewell (3 December 2012). "San Onofre steam generators shipped". Los Angeles Times. Retrieved 4 December 2012. ^ Abby Sewell (15 February 2013). "NRC asks Mitsubishi for report on San Onofre equipment issues". Los Angeles Times. Retrieved 15 February 2013. ^ Morgan Lee (7 February 2013). "New voice on San Onofre shutdown: Mitsubishi". San Diego Union Tribune. Retrieved 15 February 2013. ^ Root Cause Analysis Report for tube wear identified in the Unit 2 and Unit 3 Steam Generators of San Onofre Nuclear Generating Station (redacted) (PDF) (Report). Mitsubishi Heavy Industries. UES-20120254Rev.O. Retrieved 19 June 2014. ^ "San Onofre Nuclear Generating Station - Final Significance Determination of White Finding and Notice of Violation, NRC Inspection Report 05000361/2012009 AND 05000362/2012009" (PDF). ^ Lee, Morgan (December 24, 2013). "NRC: San Onofre operator violated rules". San Diego Union Tribune. Retrieved 28 December 2013. ^ "Nuclear panel rules San Onofre restart requires public hearing". Reuters. 13 May 2013. Retrieved 11 June 2013. ^ Abby Sewell (13 May 2013). "San Onofre ruling creates confusion". Los Angeles Times. Retrieved 8 June 2013. ^ a b Abby Sewell (May 28, 2013). "Sen. Boxer suggests Edison 'misled' public on San Onofre". Los Angeles Times. Retrieved 8 June 2013. ^ blood, michael (7 June 2013). "Calif Utility Will Close Trouble Nuclear Plant". AP via ABC News. Retrieved 7 June 2013. ^ a b "Arbitration Demand was filed against Mitsubishi Heavy Industries, Ltd. and Mitsubishi Nuclear Energy Systems, Inc". Mitsubishi Heavy Industries. 17 October 2013. Retrieved 19 June 2014. ^ Matthew L. Wald (7 June 2013). "Nuclear Power Plant in Limbo Decides to Close". New York Times. Retrieved 9 June 2013. ^ Walker, Mark (7 June 2013). 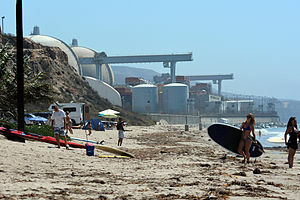 "Workers, surfers, pols react to San Onofre". The San Diego Union-Tribune. Retrieved 7 June 2013. ^ Anderson, Erik. "San Onofre Settlement Puts Ratepayers On Hook For $3.3B". KPBS Public Media. Retrieved 2017-02-28. ^ Sharma, Amita. "Critics Unhappy With Kamala Harris' Approach To San Onofre Probe". KPBS Public Media. Retrieved 2017-02-28. ^ "Closed San Onofre Nuclear Plant Auctions Machinery". The New York Times. 21 February 2014. Retrieved 21 February 2014. ^ "Calif. nuclear plant to cost $4.4 billion to dismantle". CBS News. AP. Aug 2, 2014. Retrieved 3 August 2014. ^ "Southern California Edison Awards San Onofre Nuclear Plant Decommissioning Contract to AECOM, EnergySolutions Joint Venture". Edison International. 20 December 2016. Retrieved 22 December 2016. ^ McDonald, Jeff (7 April 2017). "Edison agrees to negotiate new home for nuclear waste from San Onofre". San Diego Union-Tribune. Retrieved 8 April 2017. ^ "SCE claim rails against Mitsubishi". World Nuclear News. 19 July 2013. Retrieved 21 July 2013. ^ "International arbitration over SONGS closure". World Nuclear News. 17 October 2013. Retrieved 18 October 2013. ^ Keiko Nannichi (29 July 2015). "U.S. nuke plant operator files $57 billion case against MHI". The Asahi Shimbun. Retrieved 1 November 2015. ^ "$400 million insurance settlement for San Onofre outages". World Nuclear News. 23 October 2015. Retrieved 25 October 2015. ^ "Tribunal awards damages for SONGS generators". World Nuclear News. 14 March 2017. Retrieved 18 March 2017. Wikimedia Commons has media related to San Onofre Nuclear Generating Station. "NRC: San Onofre – Unit 1". Nuclear Regulatory Commission. February 7, 2011. Retrieved 2011-03-17. "San Onofre 2 Pressurized Water Reactor". Operating Nuclear Power Reactors. U.S. Nuclear Regulatory Commission (NRC). February 14, 2008. Retrieved 2008-11-25. "San Onofre 3 Pressurized Water Reactor". Operating Nuclear Power Reactors. NRC. February 14, 2008. Retrieved 2008-11-25. This page was last edited on 27 March 2019, at 13:15 (UTC).